Fifteen years ago Metalogic developed a stand alone scanning system to handle test certification called Imago X. iMetalScan followed which was integrated into the iMetal ERP system. Now available in version 2.38 is iMetalScan+. Reasons for its development? Changes in browser and mobile technologies dictated that Metalogic refreshed the supporting technology. Beyond this, our client’s requirements for accepting multiple formats, storing and accessing them in many ways, lead to a complete rewrite of the application. 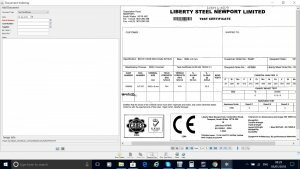 iMetalScan + is now available as an integrated iMetal module, and also as a stand-alone system that can be used by itself or integrated with other ERP type applications. Additional image management options such as annotations. To ensure smooth and successful migrations, import functionality has been developed alongside the new iMetalScan+, which will allow documents and indexes to be imported from earlier iMetalScan versions or third party scanning solutions. Existing clients can access the release notes for Version 2.38 with details of the new application and should contact their account manager for details of how to upgrade. GDPR – What is it? Are you aware of it? Have you planned for it?